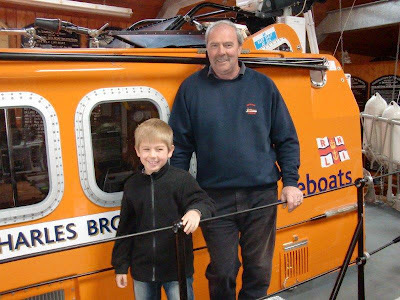 During the Easter school holidays, Swanage Lifeboat Station welcomed Charlie Wells, aged 7 from Bristol, some three hours journey time. Charlie, an enthusiastic member of Storm Force, saves his pocket money, and requests money rather than presents from friends and family for his birthday in order to donate to the RNLI. He brought with him a most welcome £150. The highlight of Charlie’s day was to watch his first launch of Swanage’s Mersey and D Class Lifeboats on exercise. 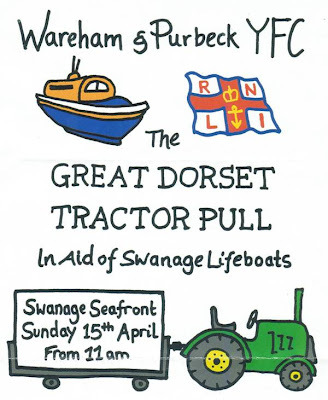 We are very grateful to Wareham and Purbeck Young farmers for donating all the money from their annual tractor pull to Swanage Lifeboat. It was a bright but cold day with a brisk North Easterly wind. The teams lined up in a series of heats with the 'Lifeboat Crew' and 'Blandford Young Farmers' eventually getting through to the final. After a great last run the Lifeboat Crew took the lead and won the final! Thanks to everyone who took part and helped organise the event, here's what you helped to raise. An excellent result, thank you! If you're up for another challenge why not enter a team in our Raft Race on Sat 18th August, its part of our annual Lifeboat Week. If you're in the area why not pop along to see how the teams do. We'll be entering a team and we'll also have our Souvenir stall set up.